When expectations are high, I find it rare for a destination to so completely and entirely surpass anything I could have anticipated. Without a doubt, this was the case with my first visit to South Georgia island in the southern Atlantic Ocean. Biologically, it is part of the Antarctic ecosystem. As a conservation travel destination, it is completely in another realm – a place so full of life and majestic scenery that I still can’t believe it exists. The journey to get here is a long one. For most visitors, it involves a night in Ushuaia, Argentina – the southernmost city in the world – followed by a day at sea, two days in the Falkland Islands, and two more days at sea before reaching the northwest corner of South Georgia. The voyage itself is marvelous, mind you. Albatross, petrels and seabirds galore tail the ship as you bounce through the Southern Ocean. Dolphins, seals and whales make frequent appearances. And the Falkland Islands are a treasure in their own right. 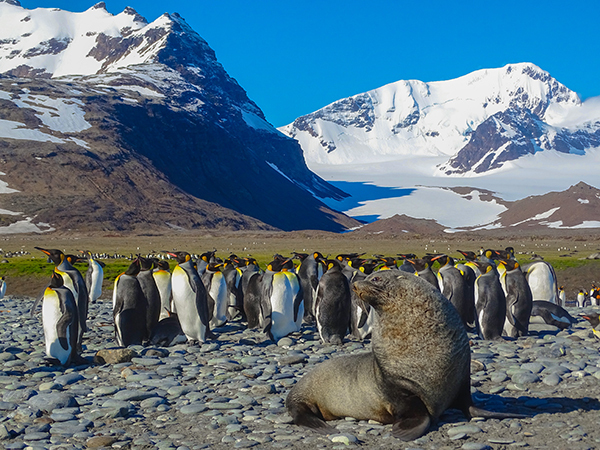 In the Southern Ocean, your adventure itinerary will always take on a truly expeditionary nature. Land excursions are planned not on what we hope to see, but on that which nature allows us to see. A particularly windy day might mean moving onward to a more sheltered cove. A beach full of testosterone-fueled fur seals might mean we land a kilometer further up the beach than initially planned. Luckily, South Georgia has seemingly endless options for extraordinary landing sites. Our first stop was Salisbury Plain, with nearly 250,000 king penguins, thousands of fur seals and hundreds of lazy elephant seals resting after their recent mating season. As a backdrop, the steep and jagged peaks of South Georgia emphasize the true magnitude of the spectacle in front of you. Imagine an ocean flooding the Himalayas and leaving only the last 9,000 feet or so above water – this is what South Georgia looks like to me. 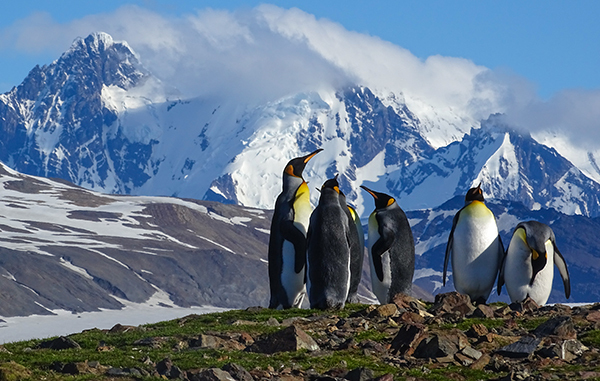 Each landing site offers new scenery, hundreds of thousands of penguins, seals galore, calving glaciers, hanging glaciers, icebergs, and a sense that you’re a part of something truly special. Abandoned whaling stations and maritime cemeteries remind us of the bygone, heroic age of exploration. We see whales, hear tales of their abundance before the whaling era, and ponder what it will take to bring whales back to their former numbers. After seeing, smelling and hearing the astonishing amount of life on South Georgia island, it is difficult to comprehend that the current environment doesn’t come close to hosting the numbers that it used to before human presence. After completion of a thus-far-very-successful rat eradication project (to eliminate the invasive rats introduced by the early explorers), it is estimated that South Georgia will become home to an additional 100 million seabirds. Of course, this will take time. But thanks to money generated by conservation travel, South Georgia island has the opportunity to take on projects like this. With the proper governance and support from tourism, perhaps the island will exceed even our wildest expectations once again.